If you'd like to send a message to her family, you may do so here: impact@beyondthewallfilm.com. If you would like to make a donation in Jenny's honor to the Freedom Behind Bars Foundation, donate here. Freedom Behind Bars Foundation has partnered with Journeys in Film in developing a comprehensive curriculum guide for high school and college classrooms. Letters From The Dhamma Brothers E-Book now available in Apple's iBookstore. The E-Book is filled with dazzling photos as well as interactive video and audio features. Listen to the Dhamma Brothers speak about their lives in prison and the fresh, new perspectives that they have gained from Vipassana. 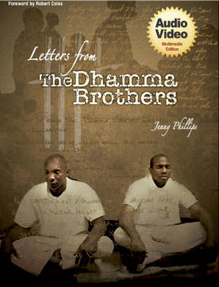 The Dhamma Brothers premiered on the Oprah Winfrey Network May 6th as part of the Super Soul Sunday programming! Watch the short film that updates you on many of the Dhamma Brothers, as well as the status of the 10-day program at Donaldson Correctional Facility.